Hey y’all. Who loves to spend all day editing photos for a blog post? Really – you’ve got your hand raised? Because though I love photography and editing, I do NOT have all day to do it what with kids who want to eat and a spouse who likes me to shower and all, so maybe if you have all day to edit photos I should take time management tips from you. 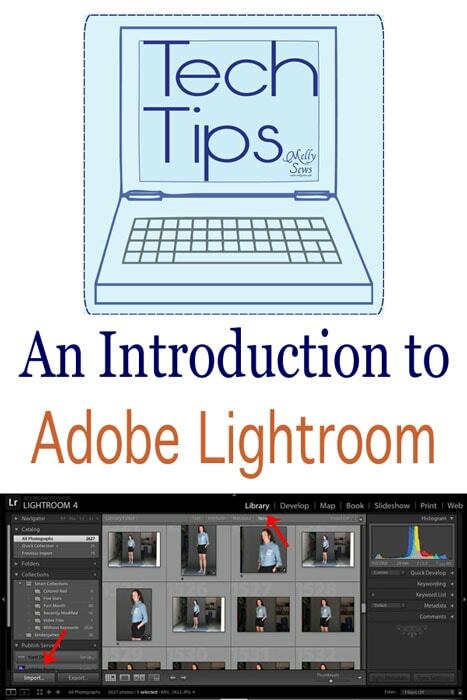 For the rest of us with more grand ideas than time, I’d like to take you through a quick introduction to Adobe Lightroom, which has reduced my photo editing time by more than half. No exaggeration. Lightroom is part of the Adobe Cloud, but is also one of the few Adobe products you can still buy by itself. It can do a ton of cool things – many of which I have no idea how to do. But I’m sure there are a bazillion internet tutorials on how to get it to do cool things. And someday when I have time I’ll go look them up. But in the meantime this is the quick and dirty intro – this is what I do to the majority of pictures I put in my patterns and on my blog – because Lightroom is FABULOUS for batch editing. 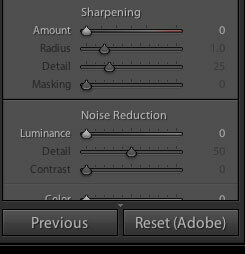 Even if you’re like super advanced and record actions in Photoshop to batch process, this is still faster. For real. So, when I open up Lightroom, this is what I see – whatever pictures I worked on last. I start off with the “Library” tab – this is where you get the pictures you want to work on. Then down on the bottom left you click “Import”. After clicking Import this screen appears. Use the menu on the left to find the location your pictures are in. 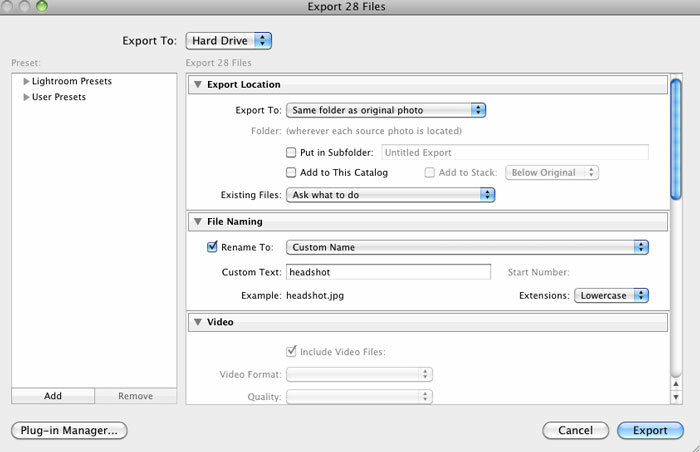 You can import directly from your camera, your computer, an external hard drive, etc. Next you’re going to switch to the develop tab. Over on the right, tools for editing and adjusting your photos appear. 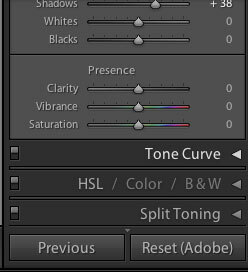 Lightroom puts then in order for a good editing workflow. Start with cropping if necessary, (tip: hit the x key on your keyboard to switch your crop box from landscape to portrait or vice versa), then I usually white balance. Click your white balance dropper on something white in your picture. Next I scroll down the toolbar a bit and adjust exposure, usually brightening things up a bit. And taking the Luminance up a little gives you magically beautiful skin. You can also sharpen a bit for the screen. And literally a few seconds later, all your selected photos are edited! You may want to go through and tweak a couple, but you’re mostly done except for reducing size and optimizing them for your blog (remember this Tech Tip?). And Lightroom makes that super fast too. 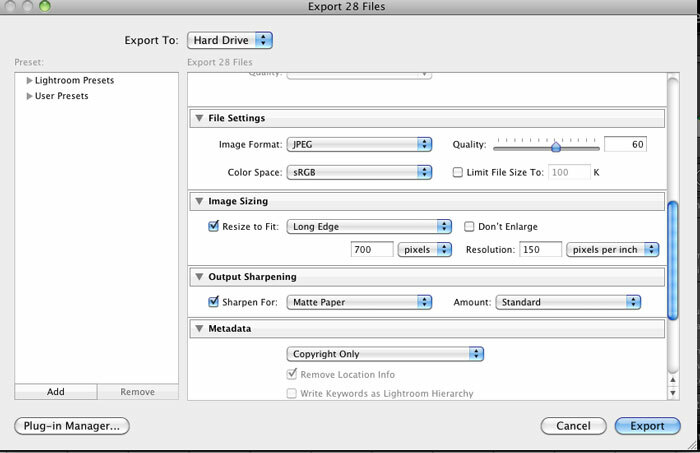 Select your photos and go to File>Export and this box will pop up. Scroll a little further down and you can have your images resized. Scroll down a little further and you can even have it sharpen and watermark your photos. 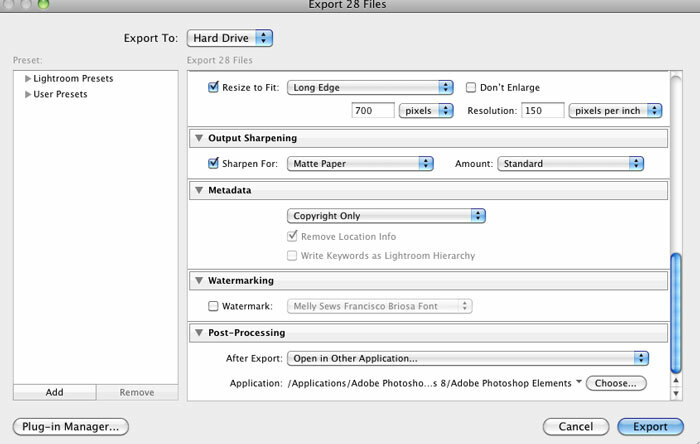 And then you hit export, and all your photos are ready to go use on your blog! I still use Photoshop to do heavier editing, make my photos even smaller files with the “Save for Web” feature and to apply custom watermarks (Lightroom will put the watermark in the same place on every picture – not something I always want). But I’d say 90% of my editing takes place in Lightroom now. Which means I spend a lot less time on photo editing. Hope this helps you! Remember you can see all my tech tips here.